Recently I was craving a bright, vibrant and colorful salad after realizing I'd had too much red, brown and wintry-hued foods. One of my favorite salad greens is a delicate lettuce called mache, also known as Lamb's Lettuce. I'm currently reading "United States of Arugula" and having read about the rise of gourmet lettuces in the past three decades must have tickled my subconscious mind. 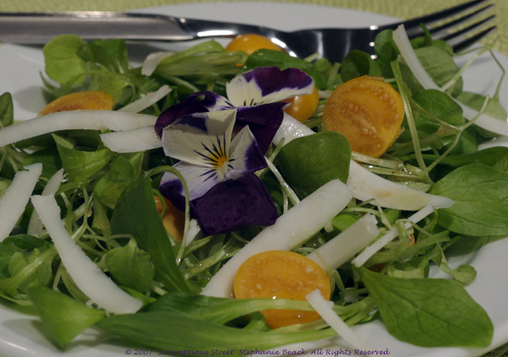 So, when I spied it in the Garden of Eden, I knew a beautiful and bright salad would celebrate the abundance of flavors we can have in our salads these days. Last autumn I had found perky and tart husk tomatoes that reminded Mr. Scrumptious of something he knew growing up but they weren't exactly right. I found them this time, labeled as goldenberries from the Andes; they have a definitive sweet-tart punchiness. These two items and a couple of unique twists on a vinaigrette yielded my delicious "Mache and Goldenberry Salad with Orange Hazelnut Vinaigrette." 1. 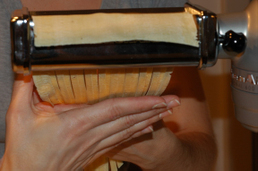 Dampen a paper cloth and gently wipe clean the leaves of the mache. Wrap the damp paper towel around the mache to keep it fresh while you prepare the rest of the salad. It's very delicate and cannot really be washed. Husk (if appropriate) and wash goldenberries. Shave the cheese and set aside. 2. Cut the goldenberries in half with a small knife. 3. Plate the mache and sprinkle with goldenberries. 4. In a small bowl or glass measuring cup, add the oils, vinegar, salt, pepper and orange extract. Whisk thoroughly until the dressing is fully mixed and incorporated. 5. Drizzle the dressing over the salads making sure to just lightly kiss the lettuce with the dressing. The mache is very delicate, one doesn't want to use a heavy hand on the dressing. Garnish with shaved cheese and edible flowers if desired, and serve immediately. I chose to use hazelnut oil here to add a richer flavor to the dressing and help balance the sweet-tart of the goldenberries with the light nuttiness. Also, the orange extract helped to keep the taste fresh and vibrant and worked extremely well. By the way, little lambs don't really eat mache, I was just playing with the nursery rhyme in my head. It's called Lamb's Lettuce because the leaves resemble a cute little lamb's tongue, I guess. Although green. And, not wet or raspy. So, who really knows? The frugal side of me abhors waste and as I so often do, I saved the tasty braising liquid from my recent artichoke dish to use in a different dish, in a different way. The extravagant side of me blew invested that savings into a luscious and yes, expensive, dish. But get this: I found stunning FRESH PORCINI MUSHROOMS. In January. In New York. Bliss!! I have lamented before that no matter what they say, dried porcini mushrooms do not compare to fresh. So, imagine my glee and wildness upon seeing the gorgeous funghi. And then I went to my fish monger and it got worse, um, I mean better. He had incredibly fresh sea trout from Tasmania. Yes, flown halfway around world, across the International Date Line. Silly, but true: I scrimped in one way but giddily threw money at the grocer and fish monger to create a meal that just doesn't come along every day. I wanted to celebrate the joy of fresh porcini and Tazzy Trout with wild decadence. Here's my oh-so-scrumptious-completely-worth-every-penny "Tasmanian Sea Trout with Fresh Porcini Cream Sauce". I justify my actions to my frugal side with "At least I rode a good wave a little further" and "The meal was equally as good as what one can find in many restaurants and while expensive for home cooking, it was still a bargain, compared to menu prices in this city". The fish, though it looks like salmon, definitely tastes like trout. It's delicate and not nearly so overwhelming as salmon. 1) If you still have the bay leaves in your poaching liquid from prior use, make sure to remove it. Pour the liquid into a large skillet or saucepan that comfortably accommodates the fillets without crowding. The liquid should be at least 3/4" deep. If you don't have enough, add vegetable or fish stock or white wine. Put the two fresh green bay leaves into the liquid. Bring the liquid up to a gentle simmer. 2) Heat a skillet on medium-high heat and add the extra virgin olive oil. When shimmering, put in the mushrooms, and shallot. Sauté until the mushrooms are a deep golden brown color and give off a hearty, perfumed earthy scent. Add the garlic and stir. 3) Add the fish fillets to the first pan with the simmering poaching liquid, skin-side up. Cook fish for 8 minutes per inch of thickness. To check for doneness, separate the flakes with a fork. Fish is done if the flakes separate without much resistance. 4) In the mushroom pan, add the peas and sauté until they are just tender. Make a space in the center and add the cheese, melting in the middle of the pan. Gently fold the mushrooms into the cheese as it melts. Add about 2 T. of the braising liquid from the fish into the mushrooms and cheese and gently stir to mix in. Add the heavy cream and stir until the sauce is thick, smooth and velvety. Remove the mushrooms from the heat. 5) At this point, the fish should be done. Remove the fish gently with a spatula and plate. 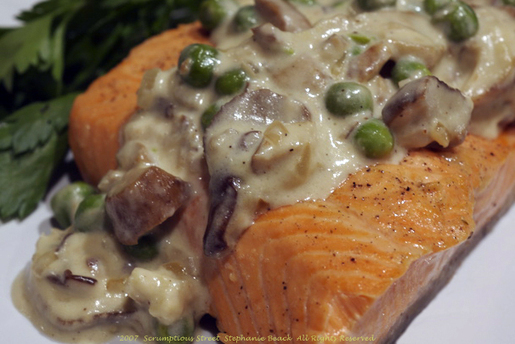 Spoon the mushrooms sauce over the fish and serve immediately. 6) Taste. Swoon. Moan. Repeat. I absolutely love artichokes nearly to the point of obsession. I eat them at every opportunity. At our New Year's Eve party, I created a pink peppercorn dipping sauce that was truly fantastic. I knew then that I wanted to try it with artichokes and just had to think about how I wanted to cook and present the combination for all of you. The result; my "Braised Artichoke with Pink Peppercorn Dipping Sauce". You get a bonus round in this posting, I include both of my recipes, instead of just one! As I was growing up, we ate artichokes one way in my family: the Sicilian manner that our landlady, Nunzia, taught my mother when I was still an infant. Nunzia's Sicilian preparation is delicious, and the only way we ever did it when I was growing up. In essence, you boil/steam the artichokes and have them stuffed whole with onions, cheese, breadcrumbs and drizzled olive oil on top. Decadent. We never dipped them in butter and lemon or made a simple aioli, like most Americans do. My brother prepared his own variation humorously called "Heart-ichokes" over Christmas, and it was similar to Mom's but a lot more gooey, yummy stuff inside and loads of garlic salt. It was also delicious and the "heart" refers to the high levels of fat in his recipe that would clog those arteries. I like to steam, braise, fry, toast, shave and eat raw, puree, or sauté my artichokes. Any preparation, I've tried it at this point. For this recipe, which I intended from the beginning to be a marriage with the dip, I wanted loads of flavor in the artichoke itself, and the leaves completely unadorned. I chose a variation on braising (skipping the typical browning process) and loading the broth with lots of delicious aromatics. 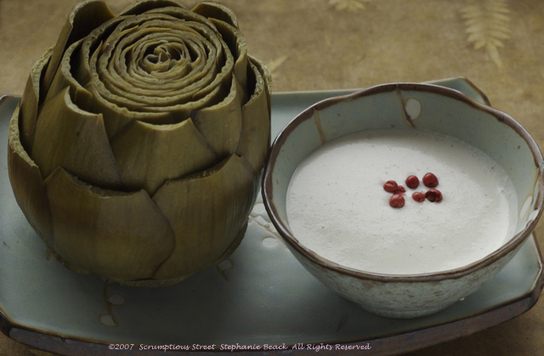 The dip was intended to be the artichoke's sole condiment, since it is very rich and flavorful. Incidentally, pink peppercorns are not really a peppercorn at all, they are the dried fruit of the Baies Rose plant. They do, however, have a very delicate peppery flavor, far more light than black pepper. Prized in France, they are notoriously expensive, but worth the splurge occasionally. 1. 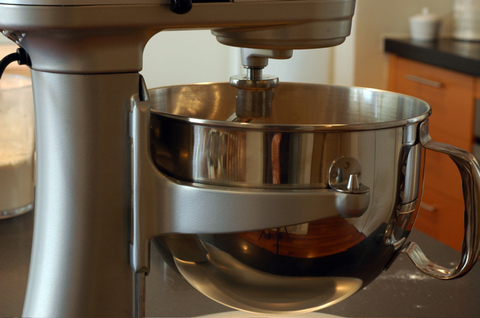 Grind the peppercorns in a spice grinder, coffee grinder or mortar and pestle, until fine. Shave the parmigiano reggiano cheese with a vegetable peeler, unless you can find it already shaved. 2. Add the ground peppercorns and shaved parmigiano reggiano to a food processor fitted with the sharp chopping blade. Set the processor to "on" and process until the peppercorns and cheese are the consistency of fine breadcrumbs. 3. Add the crème fraîche or sour cream, kosher salt and mayonnaise to the food processor. Pulse gently until the dip is smooth, about 30-40 times. 4. Pour the dip into a medium bowl, scrape the excess from the processor bowl with a rubber spatula. Cover the bowl and refrigerate until ready to use. Note: the dip will separate a little after it sets and the cheese settles to the bottom. Make sure to always mix it up again before serving. I thank the adorable little fries shop in New York called Pommes Frites for this dip idea. I tasted one of their dips and embellished and improved it. This is one of my favorite dips ever. Chips, vegetables, bread...straight off the spoon. It's delicious. "Artichokes Braised with Lemon, Wine and Aromatics"
1. First you will need to trim and prepare the artichokes. Fill a large bowl with cold water, slice one lemon in half and squeeze the juice into the bowl of water. Snap off all the tough outer leaves of the artichoke, slice off the top about 3/4" down from the tips and use kitchen shears to trim all the pointed edges of the leaves. Rub half the lemon everywhere you make cuts or trim, so the leaves don't turn brown too quickly. 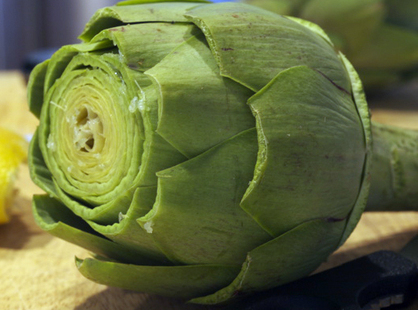 Cut off the stem at the very base of the artichoke but keep it, peeling all sides and the bottom. Drop the artichoke and stem into the bowl of cold water. Repeat for each artichoke. Let the artichokes sit in the bowl while you prepare the braising ingredients. 2. Use a large pot that will fit all of your artichokes easily, without crowding and so they'll sit upright. Add the water, the white wine, the second lemon sliced, garlic, fresh bay leaves and thyme to the pot. Bring the pot to a steady simmer. 3. When the broth is simmering, add the artichokes by placing them base down in the pot. Notice that as the artichokes cook, you will be braising and steaming them at the same time. 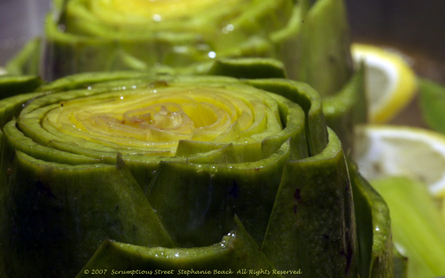 It is normal for the artichoke to go from a bright and vibrant green to a muted, army-green hue as it cooks. Drizzle 1 T. extra virgin olive oil inside the leaves of each artichoke. 4. Bring the water to a strong simmer but below boiling and cover the pot with a lid that fits tightly. Braise the artichokes about 45-50 minutes. The artichokes are done when you can use a fork to easily pull down on one of the outer leaves and it comes loose. Keep in mind the inner leaves will be much more tender. Test the outer leaf in this manner and pull it out of the water. Let it cool and then test by scraping the flesh of the leaf with your teeth. The flesh should be soft and slightly creamy but not mushy nor fibrous. 5. When done, remove the artichokes with a pair of tongs and let drain before plating. In this case, serve with a bowl of the pink peppercorn dipping sauce. I tend to save the braising liquid when I make artichokes, the broth is so delicious I can never bear to throw it out. With this dish I reserved the liquid and will feature it in another post later on this week. This blog entry on Simply Recipes is great at showing you how to eat artichokes, if you've never had one before. (The author explains the typical American preparation I mentioned earlier.) I really hope you try my recipes either together or separately. Let me know what you think! FINALLY winter came to New York! You may remember from my post a while ago, that I love winter and one main reason is all the hearty soups and stews that go along with it. Well, it's been like Spring the past two months here, just like so many other places in the world. At last, Old Man Winter came a knockin'. And what did I do? Whipped up a pot of my very most delicious vegetarian chili. 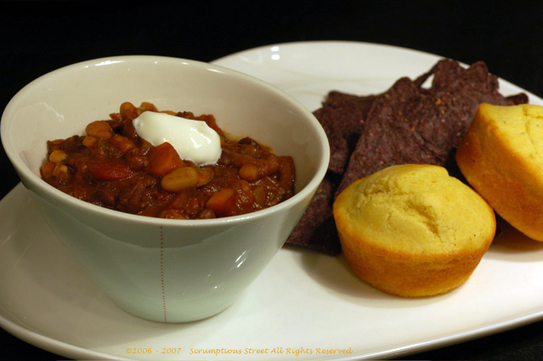 The hesitation in the title is a tip of my virtual hat to the fabulous Homesick Texan, a great blogger and personal acquaintance, who vehemently believed that anything with beans is not "chili". To Texans, that has a very significant meaning and the rest of us who taint it with other stuff are committing some form of sacrilege. Well, I saw the great Homesick Texan in person this week and she has smudged the lines a bit to make way for the rest of us and after getting her official permission I feel I can now continue calling it my "Scrumptious Vegetarian Chili". No meat, no slurry, no pasta for you Cincinnati kids. Sorry, purists, but this is all I have ever called it and it's my very own, nothing regional about it. If you all would like to participate in renaming my dish to something other than vegetarian chili, I'm all for it. Put your name for my stew in the comments and I'll send the best enry a little gift of some kind. I promise. I like my chili hot. Damn hot. Especially in the cold winter. Which it wasn't until this week, when it finally hit below 20˚Farenheit. So, this recipe carries a decent level of incindiary properties. If you don't like it spicy, cut back at least half on the chile and peppers. If you like it mild, make minestrone cut back even more. You can substitute dried beans for the canned ones here. It's been my method for years due to ease and fun, but you can go either route. I like my chili thick and hearty, so unless you're cooking the chili all day in a crock pot, the dried beans take too long to break down. Not feasible on a weeknight for me. 1. Chop all the vegetables and measure out all the dry ingredients. Open all the cans. Dump all the canned beans in a colander and rinse well. You don't want to retain any syrup in the beans. 2. Heat a large heavy bottomed pot, preferably enameled cast iron, on medium heat and add the olive oil. 3. When the oil is hot but not smoking, add the onion, garlic and carrot and saute for a few minutes, until the onion is translucent and the garlic is golden but not dark brown. Lower the heat to medium. 4. Begin adding each of the ingredients, tasting and layering the flavors as you go. Add the jalapeno pepper, cremini mushrooms and stir to incorporate. Add the bittersweet chocolate and stir until it's fully melted and incorporated. Add the kosher salt, black pepper, red chili pepper flakes, oregano, cayenne pepper, bay leaves, chili powder, chipotle chiles and stir. Add the dark brown molasses sugar. Add the can of diced tomatoes and stir. Add all the rinsed beans. 5. Add the water. Raise the flame to medium-high and stir well. Bring the soup up to a gentle boil. 6. Reduce the heat to low, replace the heavy lid on your pot and simmer for 45 minutes to 1 hour. This is what turns it from soup to a thick and hearty stew. Be patient, wait for it to get thick and taste every 15 minutes so you can adjust if necessary. If you find it's going too hot, add a little bit of sugar. 7. Take two capsules of Beano. TRUST ME. DO NOT SKIP THIS STEP IF YOU'RE GOING TO BE NEAR OTHER PEOPLE FOR THE NEXT 12 HOURS. Serve the chili in a hearty bowl and garnish with sour cream. This helps cut the heat a little too, besides being delicious. We love to eat our chili with cornbread slathered with honey. When I was 11 years old, I began making corn bread from the famous red and white Betty Crocker cookbook. But since I was a kid, I liked the fun of pouring it in muffin pans. I'm still a kid at heart and that's how I make it to this day; some things are just timeless. Here's the recipe. This chili gets better after a few days in the refrigerator and will be even hotter when you reheat. It's always fun to figure out what to do with any leftover champagne, sparkline wine or prosecco during the days after the New Year. We had a terrific party but three half-consumed bottles of champagne left in our fridge. What a tragedy! After making mimosas and little cocktails where the flatness didn't matter so much, I still couldn't pour the little bit of deliciousness down the drain. So, of course, I improvised. And, to great result created an excellent sauce for a grilled pork loin. 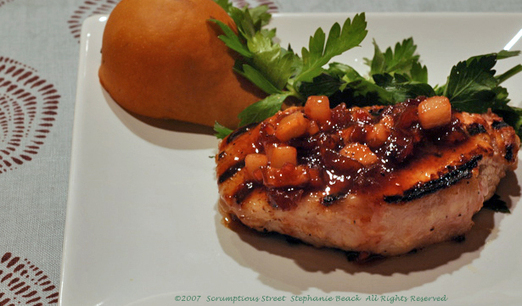 Here's the recipe for my "Grilled Pork Loin with Champagne, Ginger and Date Glaze"
1. Trim any extra fat from the edges of the pork so it's as lean as possible. Mix all the ingredients listed under the marinade together in a bowl and whisk to incorporate the flavors well. Drizzle half the marinade over the pork loin chops in a zip lock plastic bag and seal. Refrigerate for at least 1 hour, turning every 15 minutes to marinate all sides. Reserve the other half of the marinade. 2. Put the reserved marinade in a sauce pan and bring to a gentle boil. Turn flame to low and let the sauce simmer very gently, reducing to concentrate flavors by at least half or more. 3. Heat a heavy cast-iron skillet or grill pan and when hot, remove the pork loin chops from the refrigerator and lay on the sizzling grill. Grill the pork through, about 4-5 minutes on each side. Remove the pork from the grill when cooked to light pink and at least 160˚F internally. Set aside to rest. 4. Add the chopped pear and dates to the sauce and stir to incorporate. Swirl in the butter without using a utensil, until the sauce is shiny and thick. Remove sauce from heat. 5. Put the pork loin chops on a plate. Spoon the glaze over the pork, garnish and serve immediately. Congratulations Food Blog Award Winners! Congratulations to all the 2006 Food Blog Awards winners! It was a terrifically talented field, with heated voting, commenting and competition. I was extremely honored to be selected for the Top 5 in the category of Original Recipes. Rachel, from Coconut & Lime won the category and I'm sending out my congratulations to her. Many of you who read my blog voted for it, and I really thank you for your support and vote. It's great to know that many of you really like what I've been doing these past 5 months. It's for you that I make it all public. THANK YOU. 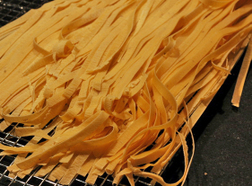 This is part two of my first fresh pasta making experience, you can read about making the pasta dough in my previous post. After all that hard work, I had built up an appetite and was famished! I decided to give the fettuccine a light treatment because I really wanted to be able to taste the noodles to evaluate my performance and didn't want a heavy sauce to obscure the pasta. 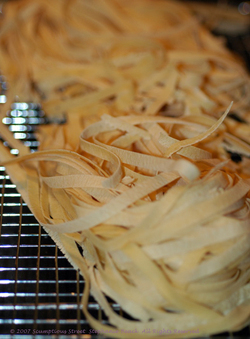 Since pasta is so versatile, there are thousands of potential variations. 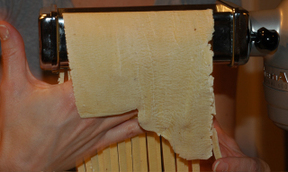 If you go to the trouble of making the fresh pasta, make sure you dress it well! 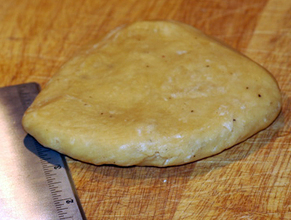 I had added freshly ground black pepper to my pasta dough so that it already had a little perky kick to it. The weather in New York was unseasonably warm this weekend-- it felt like May! So, I was craving a spring-like treatment to complement the freshness of the pasta. This recipe REALLY worked. I was exhausted but so happy that it turned out great. The arugula picks up and plays on the black pepper as I intended. The red pepper flakes continue the theme with a little more zip and pop. But, it's not fiery or hot at all, it's just got three kinds of peppery zing for depth. I added tomatoes and lemons for acid to cut the bite and added porcini mushrooms for a little body and texture so it was a meal rather than a snack. The lemon zest and parmigiano reggiano add salty and fresh touches. The pasta itself came out perfectly. It was thin and delicate and softly structured. I was shocked, given how much I struggled with the dough. I really thought it would be chewy and rubbery. It was perfect ribbons that tasted so wholesome. This recipe is really excellent. 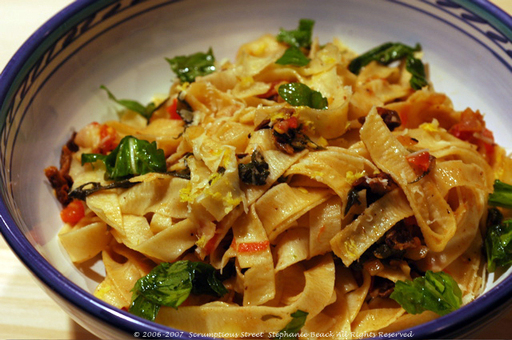 I would be thrilled if you make (or buy) fresh fettuccine and let me know what you think of my "Black Pepper Fettucine with Lemon, Arugula and Porcini Mushrooms." 1. Bring a very large stockpot of water to boil on your largest burner. Use the pasta insert if you have one. While you're waiting for the water, prep and chop all the vegetables. 2. Put the dried mushrooms, 1/2 clove garlic and kosher salt in a small bowl. Bring a kettle of water to boil and pour over the mushrooms, letting them steep to re-constitute for about 20 minutes. Drain and chop the mushrooms roughly. 3. When water is up to boil and the mushrooms are done, in a large skillet heat 3 T. of olive oil on medium heat. Saute the garlic and onion, stirring for a couple of minutes until the onion turns transluscent. Add the tomatoes, the red pepper flakes and squeeze the lemons and their juice into the skillet. Stir thoroughly. 4. At this point, the water should be boiling. Add the sea salt to the boiling water and gently lower the fresh fettuccine into the water. It will only take 1-2 minutes and is done when the pasta begins floating toward the surface of the water. 5. Add the arugula and lemon zest to the sauce and stir to incorporate. Cook another minute or so until the pasta is done. 6. 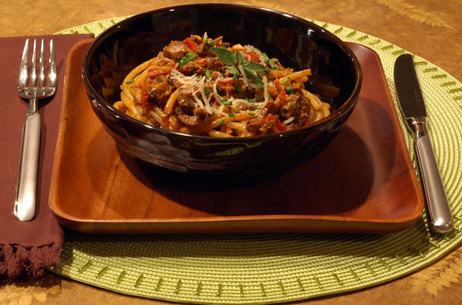 Pull the pasta out of the water with the basket or strain it in a colander. Add the pasta directly into the skillet with the sauce and toss gently with a pair of tongs. Add the grated parmigiano reggiano cheese, sprinkle another 2-3 T. olive oil over the pasta and toss lightly. 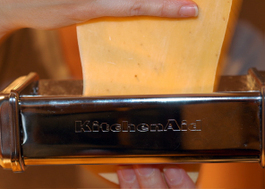 Use the tongs to plate the pasta and garnish with a little more cheese, lemon zest and arugula if desired. Serve immediately. I hope you enjoy it as much as we did at Scrumptious Street! 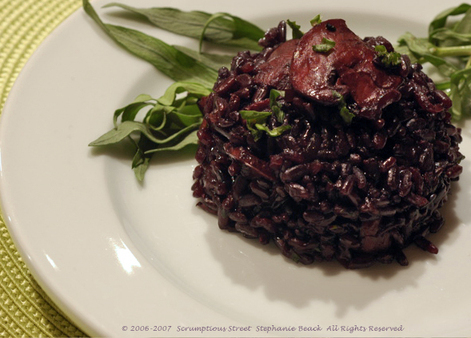 One of my favorite recent discoveries is a delicious variation of rice called Chinese black rice. It is a deep, rich, black color when raw due to its covering of black bran and it becomes a stunning shade somewhere between purple and indigo when cooked. The rice is short grain and is not very glutinous, so it becomes creamy and develops a chewy and almost sticky texture. Its flavor is intense, nutty and hearty yet the texture isn't heavy in any way. 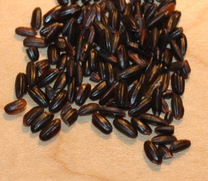 Similar to wild rice, it has a firm mouthfeel but doesn't remain woody like wild rice. Chinese black rice is also called "Forbidden Rice" because it used to be exclusive to Chinese emperors and considered an aphrodisiac so its consumption was well, forbidden. It also has high iron content and amino acids, and other great health benefits, but the research on that is so vast, I'm not going to attempt to address it here. It's just GOOD FOR YOU. This rice is so delicious, and surpasses the ordinary so far that I am glad it's not forbidden in our modern culinary experiences. So, my suggestion is that if you have never tried forbidden rice, give my recipe below a whirl. I'm sharing the love for this rice, not forbidding a thing. "Aromatic Forbidden Rice with Mushrooms and Tarragon"
Add the rice, stock, orange zest and bay leaves to a saucepan and bring up to a gentle boil. Reduce heat and cover, simmering about 30 minutes. Meanwhile, in a second small pan sauté the onion and mushrooms in the extra-virgin olive oil to a deep rich dark brown color. When deep brown, add a pinch of kosher salt and freshly ground black pepper to taste. Add the fresh herbs to the mushrooms and onions, stir lightly then shut off the heat and set aside. After nearly all of the liquid has cooked into the rice, about 25-30 minutes, add the mushroom, onion and herb mixture to the rice and fold to incorporate. Cook about another 5 minutes, until the liquid is gone but the rice is still moist. Turn off the heat and lightly stir in the butter. Enjoy this decadent and incredible side dish. I have made it recently with an orange roughy and citrus sauce and a grilled pork loin (I'll post about that one soon) and it was outstanding both times. This is really a scrumptious way to pop some flavor and color into your meal. Hello Scrumptious readers! I have some exciting news to share and I'm so thrilled to tell you about this, because YOU make it possible. I have been nominated for a Food Blog Award by the readers and editors at Well Fed Network. I was nominated in December and they just announced the top 5 contestants on the Price is Right in each category. I have been nominated for Best Food Blog - Original Recipes! I am honestly thrilled and very honored, since I've just emerged on the scene last summer and this is a very talented and passionate community. This particular category means so much to me because I do put tremendous thought, energy and soul into creating my own dishes to share with all of you. Thank you for reading, thank you for cooking my recipes and sharing your thoughts and thank you for nominating me! If you're so inclined, please vote for me here. Select the button for Scrumptious Street and click the Submit Vote button. The voting process is all audience-driven and will close on January 9. Thanks so much for your support and enthusiasm for my work. I'll post another scrumptious recipe soon, I promise!